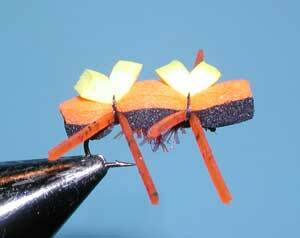 Notes: This fly was the winner of the 1995 Jackson Hole One Fly Contest. It was designed by Mark Forslund and Allan Woolley, guides on the Green River below Flaming Gorge, Utah. Originally designed as a Mormon Cricket imitation for cutthroats, it has been successful throughout the Sierras with many species of trout. 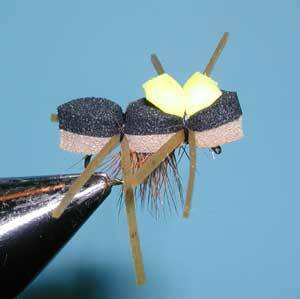 The high density foam gives the fly excellent floatation and the rubber legs give it life-like action. Use a twitching action to help make the legs move around. 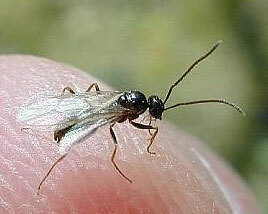 Many variations are possible with this pattern using various colors of foam, thus it is referred to as a "Mutant" ant and thus it's name, Chernobyl Ant. 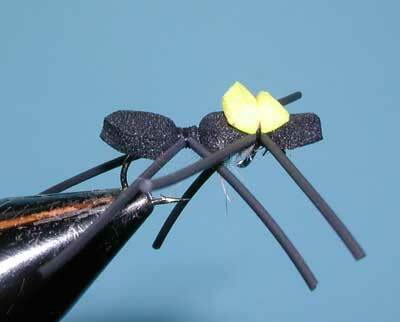 Best time to use this fly is from Late Summer to Fall from August through November.